Welcome to Today@WKU, the daily newsletter from WKU Public Affairs, for December 13, 2018. Hannah Nafziger and Dominic Castlen are first recipients of the Connie Foster Student Scholarship Endowment: Two WKU students have been awarded the inaugural Connie Foster Student Scholarship from the newly created endowment. Hannah Nafziger of Edwardsville, Illinois, and Dominic Castlen of Lexington are the recipients for the 2018-19 academic year. Cumberland Trace Incentive-Matt Rzepka Memorial Scholarship Fund announces new recipients: Eight new recipients for the Cumberland Trace Incentive-Matt Rzepka Memorial Scholarship Fund were announced on Dec. 10 during the morning assembly at the school. 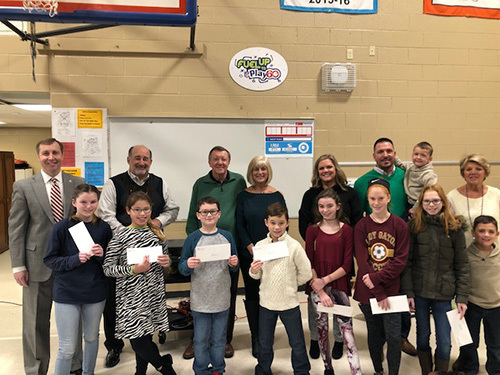 This marks the 15th year that these scholarships have been awarded to fifth and sixth graders attending Cumberland Trace Elementary in Bowling Green. This year’s recipients are Adysen Adams, Ellie Morgan, Grant Dunn, Julia Byers, Turner Allen, Annabelle Long, Amanda Hogan and Savannah Vaughn. WKU grad shares story of changing plans, but not changing vision: Imagine at the age of 23 already being established in your career only to experience something that causes a change in plans and change in career trajectory. In July 2017, Bryan Blackwell changed plans, leaving Atlanta to return to Bowling Green to earn a Master of Arts in Education focusing on Counseling and Student Affairs in Higher Education along with a Career Services certificate. Board of Regents to hold quarterly meeting Friday: The WKU Board of Regents will hold its fourth quarterly meeting at noon Friday (Dec. 14) in the Martin Regents Room of Jody Richards Hall. Volleyball: Anderson Closes Career as AVCA Honorable Mention All-American: WKU Volleyball senior middle hitter Rachel Anderson has been named an AVCA Honorable Mention All-American for the second-consecutive season, the American Volleyball Coaches Association announced Wednesday. Just over a week ago, the Sturgis, Mich., native was named one of just 18 current student-athletes across the country to earn at least three All-Region nods across their career. In addition to her pair of AVCA nods, Anderson has also been honored as an All-American by PrepVolleyball.com during her career. Football: Julien Lewis Named a Conference USA Fall Spirit of Service Award Winner: WKU Football graduate Julien Lewis was named a Conference USA Fall Spirit of Service Award winner, it was announced by the league office Wednesday afternoon. The Madison, Ala., native is 1-of-13 C-USA student-athletes across the sports of cross country, soccer, volleyball and football to be honored. Baseball: Countdown to First Pitch - 100 Days of Hilltopper History: As WKU prepares for the 100th Season of Hilltopper Baseball, WKU Athletics is treating fans to unique moments and interesting history from Hilltopper Baseball, leading up to First Pitch at Nick Denes Field on February 15, 2019. WKU Habitat for Humanity prepares for winter break project in Oklahoma: The WKU affiliate of Habitat for Humanity will be heading to Oklahoma City during the university's winter break. 2018 Year-End Giving Information: As we celebrate the holiday season, please consider adding a gift to WKU as part of your annual traditions. Your support will make a difference in the lives of our students and in the life of our University. With only a few days remaining on the 2018 calendar, this is your last chance to add to your charitable giving for the year. If you have questions about 2018 year-end giving, visit alumni.wku.edu/yearend. Exhibits at Kentucky Museum: A Culture Carried: Bosnians in Bowling Green (through May 11, 2019); Highbrow; Kaleidoscope: Kentucky Museum Quilts (through Dec. 15); The Essential Tree (through Dec. 15); Process Oriented Works (through Dec. 14); plus other gallery and on-campus exhibits. (Museum hours/visitor information) Contact Kentucky Museum, (270) 745-2592. 5 p.m.: WKU Glasgow Graduand Ceremony. WKU Glasgow, 500 Hilltopper Way, Glasgow. Contact Stephanie Prichard, (270) 861-6920. Noon: Board of Regents Quarterly Meeting. Martin Regents Room, Jody Richards Hall. Contact Bob Skipper, (270) 745-4295. 3 p.m.: WKU ROTC Commissioning. Diddle Arena. Contact ROTC, (270) 745-4293. 6 p.m.: ISEC Graduation Celebration. Downing Student Union Auditorium. Contact Cynthia & George Nichols III Intercultural Student Engagement Center, (270) 745-5066. 8 a.m.: Gordon Ford College of Business Recognition Ceremony. Diddle Arena. Contact Registrar, (270) 745-3351. 10:30 a.m.: Potter College of Arts & Letters Recognition Ceremony. Diddle Arena. Contact Registrar, (270) 745-3351. 1 p.m.: Ogden College of Science and Engineering Recognition Ceremony. Diddle Arena. Contact Registrar, (270) 745-3351. 3:30 p.m.: College of Education and Behavioral Sciences Recognition Ceremony. Diddle Arena. Contact Registrar, (270) 745-3351. 6 p.m.: College of Health and Human Services Recognition Ceremony. Diddle Arena. Contact Registrar, (270) 745-3351. 6 p.m.: Residence Halls Close for Winter Break. Note: Barnes-Campbell, Northeast and Hilltopper halls remain open. All halls reopen at 8 a.m. Jan. 18. Contact Housing, (270) 745-4359. 2 p.m.: Hilltopper Basketball vs. Troy. Diddle Arena. Contact Athletic Communications, (270) 745-4298. 2 p.m.: Hardin Planetarium Show: Celebrations for a Long Winter’s Night. Hardin Planetarium. Contact Planetarium, (270) 745-4044. 5 p.m.: Lady Topper Basketball vs. Ball State. Diddle Arena. Contact Athletic Communications, (270) 745-4298. WKU Winter Break. University closed. Offices reopen and Winter Term 2019 begins Jan. 2.